This simple twist is great for crazy holiday mornings. Fry an egg on top of and around half a bagel. If you want to get closer to a 'toad in a hole' style, increase the size of the hole in the bagel. I didn't do that here so a lot of egg ran over and under the bagel. 1. Slice a bagel in half. Note: bagel slicing is the single most common method for cutting oneself in the kitchen. I made that up, or maybe read it somewhere. Anyway, be careful. 2. Melt 1 tablespoon of butter in a small skillet over medium high heat. Note to my new subscribers: use real butter. Butter substitutes have so little or strange flavor and you'd be surprised how little butter is consumed per portion in a complete dish. Unless of course you're slathering butter on toast, bagels, or baked potatoes - in which case I even more strongly recommend real butter. 3. Place the bagel in the melted butter on the non-cut side. Cook for about 1 minute - longer if you like it more toasted. This allows the bagel top to gather some heat to help cook the egg when it is added. 4. 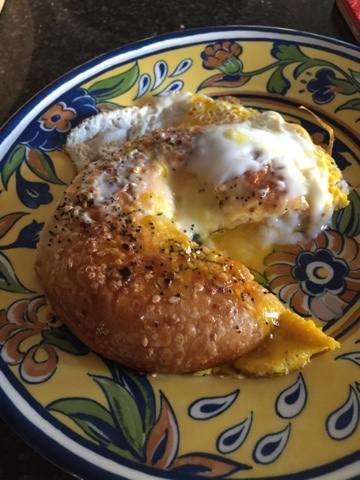 Flip over the bagel and crack one egg over the center. Break the yolk if you'd like, or not, if you're a sunny-side-up fan. 5. Cover the pan with a lid and cook until egg is done to your preference. 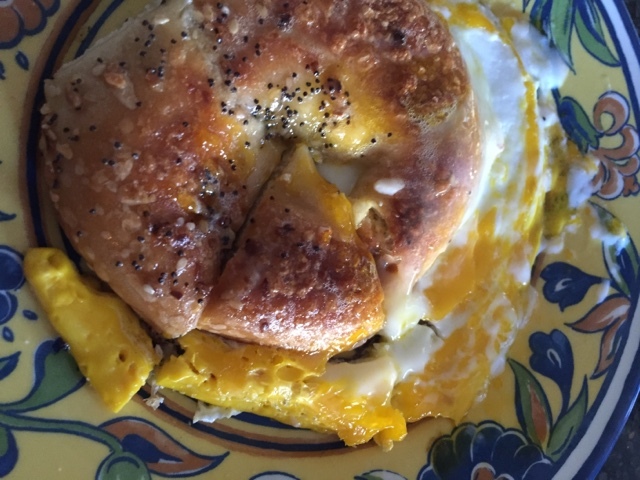 The lid allows the egg to steam slightly and cook from 'top down' a bit, since the bagel is preventing getting heat to the egg on top.